Peter Jackson is my new Santa Claus because -- aside from looking the part if you dress him -- he gives me early Christmas presents even if I've been naughty. These presents are some of the items that belong to my materialistic wishlist: (1) The Hobbit, (2) books, (3) more of The Hobbit, and (4) more books. Isn't it amazing how by doing right what he does best Peter Jackson makes every fan boy out there go ecstatic? I mean even the very teasing The Hobbit: The Desolation of Smaug teaser trailer that recently popped-up online, feels to me like a multi-million dollar jackpot. Ok, maybe I am exaggerating, but who cares, right? As long as I get to enjoy the wondrous gift Peter Jackson could offer, then I am all set. Check out this heart-thumping teaser trailer of The Hobbit: The Desolation of Smaug, so you can share with me the joy that I am experiencing now. "Beyond darkness, beyond desolation, lies the greatest danger of all..."
Make sure to tune in here on Friday as the trailer for the 3D version of the movie will come out that day. A continuation of the famous, exciting and well-anticipated vlog of The Hobbit will also be revealed next week. Also, Warner released 8 new high-definition movie stills, which we've already seen from the trailer. And in case you missed it, here's the The Hobbit: The Desolation of Smaug - Gandalf and Radagast sneak peek. 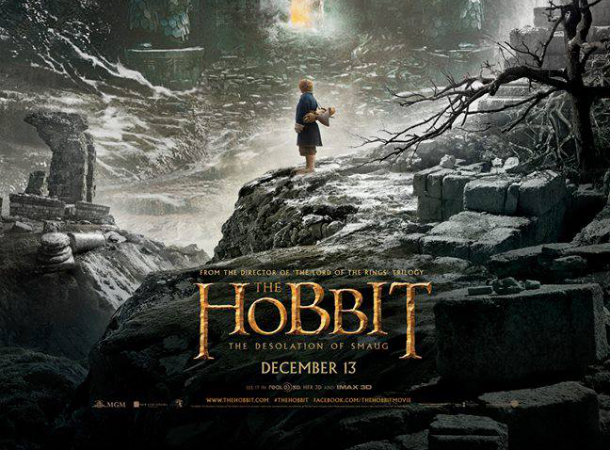 The Hobbit: The Desolation of Smaug will be released on December 13, 2013.